Poland has been given 15 days to comply with a court order to end logging in one of Europe’s oldest forests, or face daily fines of 100,000 euros. 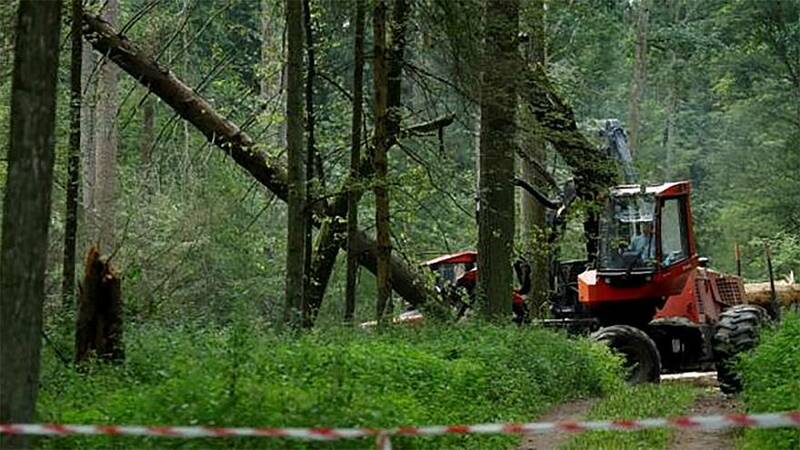 The ruling has been made by the European Court of Justice and relates to large-scale logging in the Bialowieza forest, a Unesco World Heritage site on the border between Poland and Belarus. It’s the latest salvo in an ongoing legal battle between the EU and Poland, sparked by the country’s controversial decision to triple logging quotas in the area last year. Poland cited a need to combat spruce bark beetle, a species that can weaken trees, for the increase, claiming that a failure to do so would endanger the lives of visitors to the forest. The European Commission has said the logging threatens the habitats of the rare birds and animals that live in the forest, including the European bison. The ECJ ruled in July of 2017 that logging in the area should stop immediately. However, the European Commission believes that Poland is ignoring the court ruling, hence the threat of unprecedented fines that would be payable as of Monday’s notification if any infringement was discovered. Poland has yet to respond to the ECJ ruling but Poland’s environment minister, Jan Szyszko told the Court in October that the EC had “spread lies” and “manipulated the facts”, branding reporting on the scale of the logging in the region as “fake news”. While it is illegal under EU law to log trees that are 100 years and older, Szyszko maintains the felling is for public safety reasons. The row over logging is seen in some quarters as an extension of the simmering feud between Poland and the EU. Poland’s nationalist government has refused to accept refugees as part of an EU relocation scheme, and its moves to reshape and influence the country’s media and judiciary have been heavily criticised. Environmental groups including Greenpeace claim Warsaw’s safety argument is simply a cover for commercial logging and they have maintained a presence at the forest throughout the dispute. Tensions have remained high and earlier this year scuffles broke out when a TV crew attempted to film lumberjacks carrying out logging operations. The Bialowieza forest includes one of the largest surviving parts of the primeval forest that covered the European plain 10,000 years ago. It is home to an estimated 800 European bison, Europe’s heaviest land animal, and a host of rare bird species.